A WordPress blog can be a great tool for personal, professional and even business purposes. 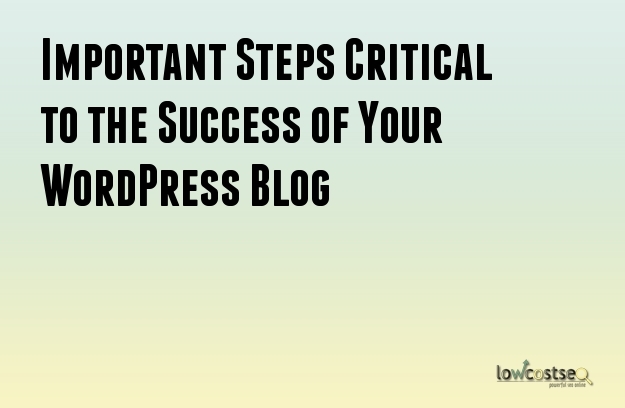 Of course, it is impossible to attain success with the blog as soon as you launch it. Rather, it will take time to build up a strong readership and become successful. Of course, there is no reason why you cannot get off to a good head start with your blog. You can make use of the following tips to achieve success a but earlier. A WordPress blog that contains nothing but reposts and multimedia is not going to achieve success anytime soon. You need to have a minimum of 10 high quality posts within a few days of starting the blog but ideally 30 will be better. Of course, you must create unique content in order to keep up their quality. Focus on a particular topic and write approximately 400 words on it minimum. The grammar should be correct and spelling mistakes should be avoided. Avoid promoting your blog unless your URLs are simple. Usually the URLs are filled with letters, numbers and special characters. You can use the WordPress settings to change it into something simpler. Keep the URLs short as well. Alternatively, you can use a plugin to customize your permalink URLs. There are many forums dedicated to WordPress blogs and you can easily find one that deals in the topic of your blog. Once you do find such forums, become a member and establish your presence. Do not forget to introduce yourself to the other members and leave behind useful comments with links to your blog wherever appropriate. It can help you increase the number of visitors steadily. You may already have profiles in various social networks. Make use of them to promote your blog. However, avoid promoting all the posts that you have written. People will start ignoring them. Select the best posts in your blog and share them. This will ensure a good response and enough traffic. Google can quickly become one of the best friends of your blog. It offers quite a few tools to get your blog noticed and bring in additional traffic. You can start with Google Analytics. It will help you track the traffic movements for your blogs. The feedback you get from the reports can be invaluable. Moreover, it will help you understand which of your blog posts are popular with your visitors. Another useful tool you can get from Google is the Webmaster Tools. It has different functions and can help improve your blog in a number of ways. It may not be essential but it is useful nonetheless. One of the more common mistakes made by WordPress bloggers is with their taglines. Many forget to change the default tagline of their blogs. Use the settings option in WordPress to change it into something that describes your blog best. WordPress has become the best platform for blogging thanks to its enormous features. You simply need to leverage them in the right way for success.